There are two projects I'm attempting to start on. They both have been on the list for a LONG time, and they both have me pretty thoroughly stumped. Sometimes composition comes so easily. Other times... not so much. One's a drawing, one's scrimshaw. I'll only be able to show the scrimshaw on here at this time. That's an ivory hammer head, and it was custom made for me to work on. I'm creating a piece for John Rohner's engraving hammer collection. 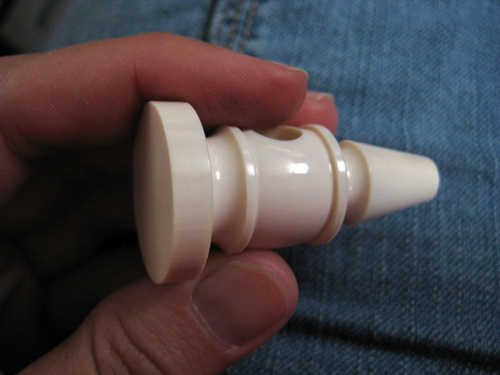 To my knowledge this is the only ivory one that's been made so far. Obviously a real engraving hammer would not be made of ivory! Over many decades, Mr. Rohner has asked various engravers to engrave a hammer head for him. It's a tremendous honor, and I think I've been a little intimidated to actually work on it... The design is totally up to me, with just one specification: he wants me to include a grizzly bear. I've been brainstorming for a long time about this, and in the last few days have sketched out numerous ideas. I think I'm getting a bit closer to something good. But I only have one part of it figured out for certain, and that's the flat face of the hammer. So although I prefer to have things all figured out before I start, I think I'll go ahead and start work on the face even though I'm still not 100% sure what I'm going to do on the sides or on the back. Whatever I decide to do won't change the face though, so maybe I need to just get this thing on the bench and see what develops! You find inspiration in horse doody? What about some bear tracks along a trail to the face of the hammer?